Invisalign is a proven method for straightening teeth using a series of custom-made, nearly undetectable aligners. Each aligner is precisely calibrated and manufactured to custom -fit over your teeth and gently move them through every stage of your treatment. There are no metal wires and brackets, and you can still enjoy your favorite foods, and brush and floss easily. 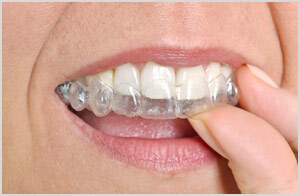 After a consultation and deciding on a treatment plan, we take impressions of your teeth, and submit it to Invisalign. Using the latest 3-D computer technology, our instructions are translated into a series of medical-grade plastic aligners. You can view your own virtual treatment plan when you start.